Famoudou Konaté is a Malinké master drummer from Guinea. 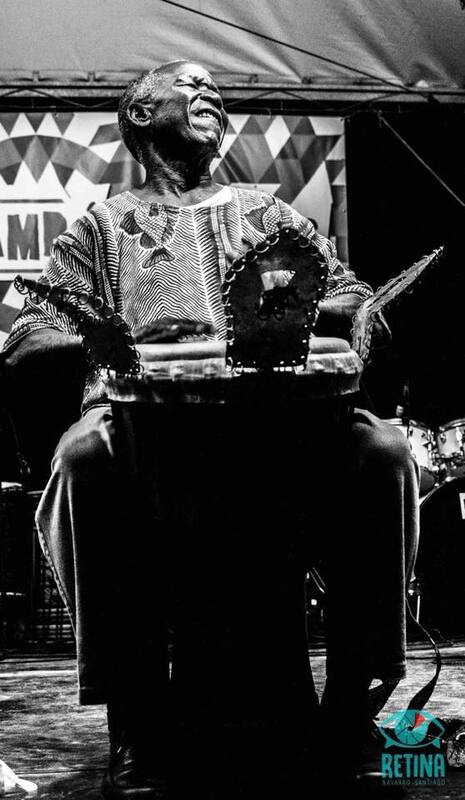 Famoudou Konaté is a virtuoso of the djembe drum and its orchestra. One of only a handful of initiated masters of the Malinké drumming tradition, Famoudou is universally respected as one of the world’s premiere djembe master drummers. He has dedicated his life to performing and preserving the music of his people, helping to elevate the djembe orchestra from its traditional roots to worldwide popularity. Famoudou was born in 1940 near Sangbaralla, a village in the Hamana region of Upper Guinea, the Malinké heartland and the birthplace of the dundunba family of rhythms. A percussive prodigy, he was drumming in community festivals at the age of eight and was soon in demand as a djembefola across the region. From 1959 to 1987, Famoudou was the lead djembe soloist for Les Ballets Africains de la République de Guinée, touring the world and performing with astounding virtuosity. During this time, Famoudou himself created many of the musical arrangements now common in West African performance groups worldwide. Billy Nankouma Konaté, born in 1977 in Conakry/Guinea, son of great djembeföla Famodou Konate, already started playing the traditional Malinke music at the age of 7. All he was wishing for was to become a great, wellknown djembeföla, all his love was dedicated to music. He followed his dream and was educated by his father for years on the traditional “fêtes” Malinkes.